Anyway, I suppose I should get to my point about OCD and Chemotherapy. Tomorrow is Round #1. Therefore, today is PREP DAY. What do you need to do to prepare before chemo? There are lots of articles talking about food and chemotherapy – people speaking of personal experiences, Dieticians, Doctors etc. The main piece of advice I have taken onboard is to have some homemade soups ready to go in the freezer. Word on the street is you usually only feel like small meals, so I think this is a sensible option to have ready to go. I have taken over the kitchen and have batched up 2 different veggie soups: sweet potato and pumpkin and cauliflower and potato..lets hope I don’t develop an aversion to these particular vegetables. I have also prepped some chia seed puddings and some healthy protein bars. I also read that ginger is advocated as beneficial to relieve symptoms of nausea and vomiting. Ginger Tea, Ginger Lollies – check! I have been warned that tomorrow may be a long day – up to 5 hours! Lunch is provided at the hospital, but I think a few extras will be required. I let my OCD run wild and I have prepared a lunchbox, that’s normal, right? 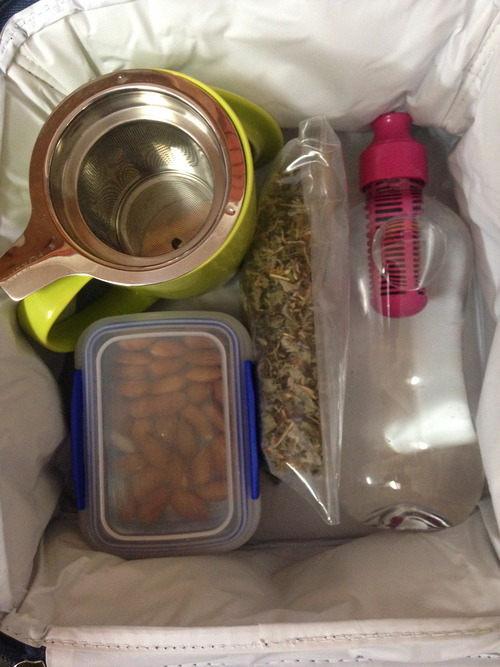 Contents: T2 filter mug (new present from Sam & Tash Velic), bag of Love Tea Herbal Tea, Almonds, Bobble water filter…it’s still a work in progress. Ipswich Hospital Oncology Ward won’t know what’s hit it. Shaved head & lunchbox – how much more prepared could you be!